The LaserLine E-Z Read rod is perfect for virtually all general construction applications: setting forms, establishing footing elevations, screed work, subgrade, finish floor or virtually any elevation on the job site. The E-Z Read Cut/Fill Grade Road has a fixed scale running away from a zero point up and down the rod face depicting how high or low you are from your starting elevation. The starting elevation is always zero and all grade shots are relative to that point. The E-Z Read rod does the adding and subtracting for you so no math is required. 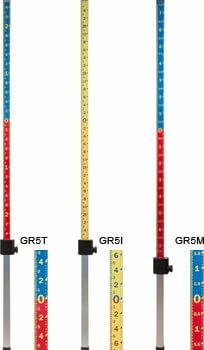 As a result, it is much faster and easier to use than a standard grade rod. Rod collapses to 5' 5-3/8" and extends to 10' 6-1/4".